In 1994 I took a Sharpie and wrote out the alphabet on my computer keyboard. Then I took little pieces of clear tape and carefully covered each key to keep from rubbing off the newly written letters. Why would I do this? Because my hands were starting to hurt and I needed a better way to type. Dvorak was the key. Not the columnist but the researcher who created the world’s greatest keyboard layout — August Dvorak. I won’t go into why the current keyboard layout, called QWERTY, is so bad. Except to say that whenever I typed on a standard QWERTY keyboard, it looked like my fingers were doing a spider dance as they would crawl all over the keyboard to type even basic words. The Dvorak layout, on the other hand (no pun intended), looks like I’m rolling my fingers across the keyboard. The home row has all the vowels on the left hand and all the major consonants on the right. The next most popular letters are on the top row on the right. Then the quote mark, comma, period and two more popular letters on the top row on the left. The bottom row contains the last letters starting with the most popular in the center and working outward to the least popular. The semicolon/colon key is on the lower left of the keyboard rather than under the Home Row which was really a dumb place for a semicolon. Dvorak refined the design based on the frequency of when a letter is used. Thousands of common words can be typed without leaving the home row. He also designed it so that your hands would commonly type words starting from the outside and moving in — rolling your fingers as you type. The switch took about a month. Two weeks into it, I couldn’t type very well in either format. But I pushed through and in a month, I could type almost as fast as I could on QWERTY. Today, I type extremely fast and with far less strain on my hands than QWERTY would cause. When I mentioned this to my sister, Melinda, she switched to Dvorak. At the time, Melinda was typing in journals written by some of our ancestors. It was a lot of work and her hands were beginning to hurt. After the switch, Melinda said her hands quit hurting and she can type unbelievably fast. Two more of my friends have switched and love it. It takes one month of regular typing. But after that, it’s easy. There are many free Dvorak typing tutorials. All modern computer operating systems support mapping the keyboard to Dvorak. Today I type on a regular keyboard. The keys clearly show the old QWERTY layout. I no longer need the Sharpie to help me. I just know where the letters are. For anyone who types for a living, a programmer or a writer, I recommend switching immediately. Find a tutorial and start. In one month, you will be finished and will never again go back to typing like a spider. 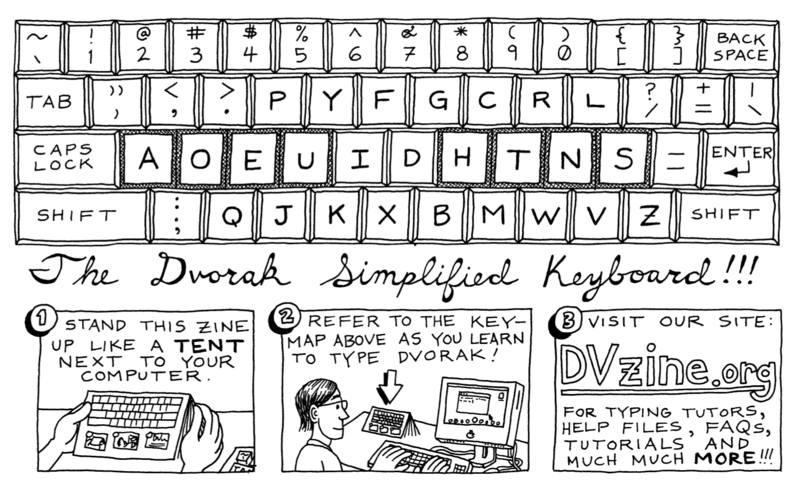 The Dvorak Zine — Excellent!